The Oscar-nominated actress was joined by her Mary Queen of Scots co-star Jack Lowden. Saoirse Ronan was treated to a pint at a Glasgow pub by Scottish actor Jack Lowden. The Oscar-nominated star is rumoured to be dating Lowden, who grew up in Oxton in the Scottish Borders, after they met on the set of Mary Queen of Scots. The duo have been in Scotland to promote the film, which opened in cinemas on Friday. 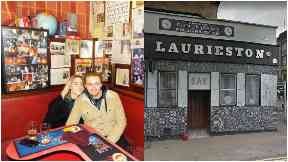 Taking a break from the promotional trail, they stopped by The Laurieston for a drink on Sunday. The bar confirmed the visit on Twitter. "Great to have you in pub yesterday Saoirse and Jack," they posted. Ronan takes on the title role in Mary Queen of Scots, with Margot Robbie playing her cousin, Queen Elizabeth I. The film chronicles the 1569 conflict between their two countries. Joe Alwyn, David Tennant, and Guy Pearce also star.